UPDATE: The images of the person of interest were inadvertently left out when originally published. Thank you to our commenters who brought it to our attention! 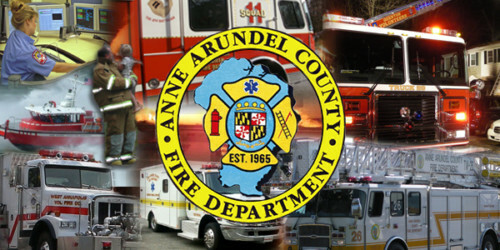 The Anne Arundel County Fire Department is seeking the public’s help in providing information regarding a fire that occurred around 4:45 p.m. on Saturday, June 23, 2012. At that time, Anne Arundel County firefighters responded to a reported fire alarm sounding at theAnne Arundel Medical Center’s Health Sciences Building, located at 2000 Medical Parkway. During their initial assessment, crews found a heavy odor of smoke in the area of the elevators. Further investigation revealed a small fire in an elevator. Firefighters quickly extinguished the fire and Fire/Explosive Investigators were summoned to the scene. A cause and origin investigation was initiated by the investigators who have determined the fire to be incendiary or intentionally set. At the present time there are no suspects; however, investigators are asking for the public’s assistance in identifying a person of interest in this case. The investigation into the incident is ongoing and investigators are asking anyone who may be able to identify the person in the enclosed pictures and/or provide information about this incident to contact Anne Arundel County Fire Investigators at 410-222-TIPS (8477). As always, any information received can be anonymous (persons do not need to leave their name or any contact information).